This is confusing because api.foo.com was and is setup to return back the appropriate CORS related headers. Surely CORS isn't supposed to just break when you switch to HTTPs, is it? The term user credentials for the purposes of this specification means cookies, HTTP authentication, and client-side SSL certificates that would be sent based on the user agent's previous interactions with the origin. Alas, making sure that Access-Control-Allow-Origin was set to the exact value of Origin and sending Access-Control-Allow-Credentials: true made no difference. Naturally, I accepted the certificate. And to my complete shock and amazement, the problem was fixed! This kind of sort of makes sense. 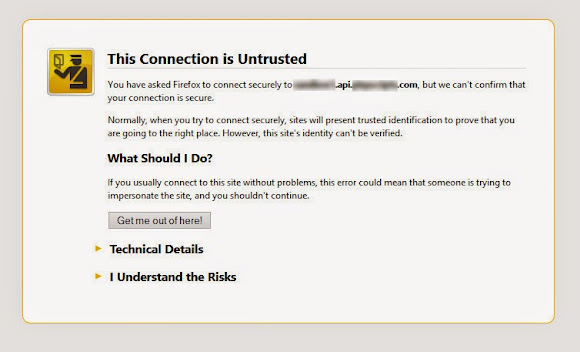 I can see why Firefox wouldn't allow CORS requests from a certificate that wasn't (a) valid or (b) added to the exception list. But man, they could have saved me quite a headache if they had somehow indicated the issue in Firebug. At the end of the day, this wasn't really a CORS issue in that CORS was perfectly setup.